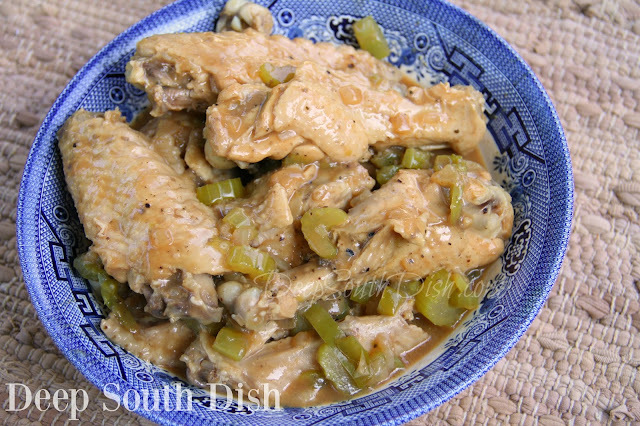 Turkey wings, slow stewed with onion and bell pepper and finished with gravy. You may see those packs of turkey wings in the meat case at the market and think back to those dried up Thanksgiving turkey wings, asking yourself why anybody would want those! When they're attached to a whole turkey, that's often the case. Overcooked, dried up wings that nobody wants to eat. If you're not from the south, you may never have even considered stewing them on their own. It really makes a big difference and they are delicious! When turkey wings are slow stewed, they are fall off the bone tender and though wings are the most traditional - because they are inexpensive - with time adjustments other cuts work well with this method too. As usual, there are as many ways of cooking them as there are cooks. Some folks like to season them, then sear them in cooking oil, put them in a baking pan, cover with water or chicken broth, seal up with foil and bake. Some saute the veggies and others like to sub in a couple cans of cream of chicken or mushroom soup for the homemade gravy. Some like to use a scant amount of water with the wings and make the gravy completely separate, then pour it over the cooked wings. Some folks do all kinds of yummy, chefy things with them, and, though I prefer this simplified version, there's nothing wrong with any of those other methods... honestly, they're all good! The one thing turkey wings do require is good seasoning, so be sure to be generous. For more of my favorite chicken and turkey recipes, check out the collection on my Pinterest page! Cut wings at the joints and add all pieces to a large pot. Mix together seasoning and add a few pinches to the wings; toss. Top wings with the vegetables and add chicken broth or cool water to almost cover. Bring to a boil and stir in the remaining seasonings. Reduce heat to a bare bubble and let simmer for about 2 hours or until tender; use a slotted spoon to remove wings to a large bowl or serving platter, covering to keep warm. Whisk together the 1/2 cup of milk with the flour and Kitchen Bouquet and slowly stir into the pot, bring back up to boil and cook, stirring until mixture thickens. Taste and adjust seasonings as needed. Pour gravy over the wings and place extra into a gravy boat for the table. Serve right away with rice, greens and cornbread. Cook's Notes: You can use this method for other cuts of turkey (legs, thigh, breast), chicken, even bone-in pork chops, though you'll need to adjust cooking times and check internal temperature to make sure it's cooked through. All purpose seasoning salt is recommended. It typically contain a mixture of salt, sugar, paprika, turmeric, onion and garlic powder and sometimes herbs such as parsley, basil, oregano and sage. You may substitute salt with some of those if you don't have the blend. Substitute pimentos, red, orange or yellow bell peppers or hot peppers, ribbed and seeded, if desired. May also use GravyMaster or substitute a gravy packet prepared according to package directions instead. Slow Cooker: Season and sear wings in oil first, then add wings and all remaining ingredients, including the gravy to slow cooker. Cook on low for 6 hours. To Bake: Preheat oven to 325 degree F. Toss wings with seasonings and add along with veggies to a roasting pan. Whisk together 2 cups chicken broth with 1/4 cup of flour and Kitchen Bouquet and pour over the top. Cover tightly with a double layer of aluminum foil and bake for 2 hours; uncover, toss and return to oven to cook another 30 minutes or until wings are cooked through and tender. Creole Style: Add two cans of diced tomatoes with green chilies, before topping with broth or water. A grocery store near us is selling 40lbs of "miscut" chicken wings for $20. I think I'm going to get some, and this looks like a great way to prepare them! Oh wow! Be sure to check out my wing collection here on the blog too Linda!